Donald Trump celebrated the good news for Republicans in the midterm elections, but called prominent Democrats on Tuesday night. 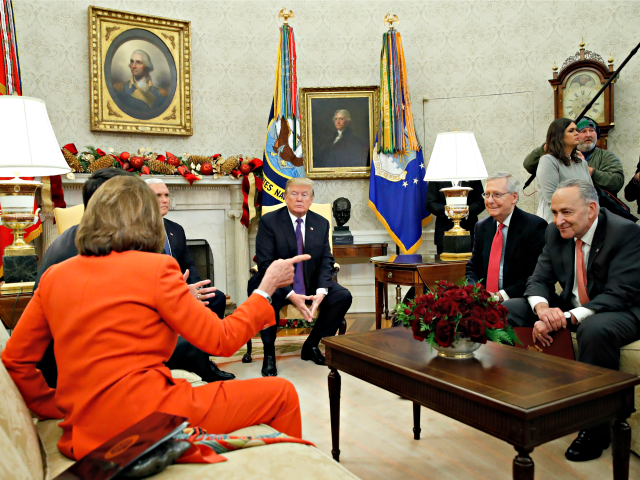 Trump also called Senate Majority Leader Mitch McConnell, outgoing Speaker Paul Ryan, and Senate Minority leader Chuck Schumer. Republicans kept the Senate majority, despite early predictions of a “blue wave” for Democrats. The president had good news, as many of the candidates he campaigned for won close races. Both Republicans in Florida, Ron DeSantis for Governor and Rick Scott for Senator, were projected to win their races, despite razor slim leads in the state. Republicans flipped Senate seats in Indiana, beating Sen. Joe Donnelly; in North Dakota, beating Sen. Heidi Heitkamp; and in Missouri, beating Sen. Claire McCaskill. Sen. Ted Cruz succeeded in warding off a challenge from Democrat Robert O’Rourke in Texas. The Republican Senate seat held by retiring Sen. Bob Corker stayed Republican with Rep. Marsha Blackburn winning big in Tennessee. Some of the western races remain too close to call, including the race with Martha McSally fighting to keep retiring Sen. Jeff Flake’s seat Republican, Democrat Sen. John Tester leading in Montana, and incumbent Sen. Dean Heller in Nevada. Trump also campaigned for winning Republican candidates for governor; Brian Kemp in Georgia and Mike DeWine in Ohio. Wisconsin Governor Scott Walker’s race remains too close to call. But Trump did experience some losses for candidates who he campaigned for. Senator Joe Manchin won in West Virginia, despite Trump’s attempt to leverage his popularity in the state to help Republican Patrick Morrisey. Kris Kobach, the Republican candidate for governor in Kansas whom Trump supported, lost to Democrat Laura Kelly.